London label Lobster Theremin is celebrating five years of existence by embarking on an extensive European tour. 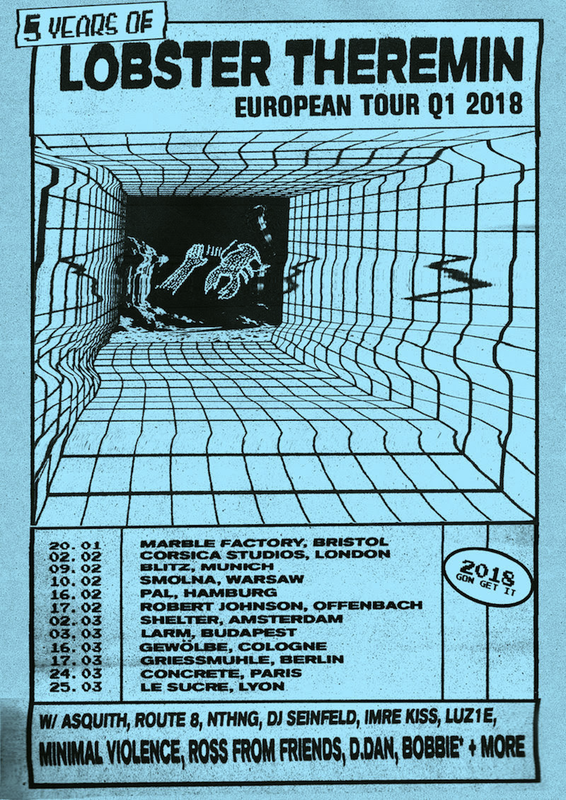 Beginning yesterday in at Bristol venue Marble Factory, the tour will see label head Jimmy Asquith and co. travel from the UK to Germany, the Netherlands, Hungary, then Germany again before finishing up in France. Travelling with Asquith for most dates is nthng and Route 8; Budapest club PAL resident Bobbie* will be at the most important shows. Otherwise the tour is a line-up in constant flux for every date. One of our Lobster Theremin favourites, for instance, Spanish maestro of decayed house DJ Seinfeld will be found at Berlin's Griessmuehle in mid-March. Around the time of the label's actual 5th birthday a bunch of special releases commemorating the half-decade milestone will be announced in early spring. For now let's enjoy the sparkling preview of upcoming release Diamond Dust by London newcomer SONIKKU, part of the label's offshoot ambient and experimental Lobster Sleep Sequence series.